The Colonel Gluer from The Gluefast Company, Inc. can be an invaluable piece of adhesive application equipment for many industrial operations. This gluing machine allows you to apply a thin film of adhesive onto the paper or board stock with ease. Typically used for gluing/mounting large paper labels, four color litho labels, or poster prints, the Colonel label gluer is available with a heavy-duty roller system of 20" and 32" roller widths for precise glue film control. A new 42” machine is now available with extra heavy-duty rollers. For information on the new Colonel-AG gluer for applying protein glues click here. To use the Colonel gluing machine, first choose the type of lay flat glue that will work best for your adhesive application needs. Remove and fill the glue tray with the water-based glue or adhesive. Once the tray is full, insert the tray back into the gluing machine. If protein glue is to be used, a water tray is filled and the thermostat is set to the desired temperature. After the adhesive application equipment is prepped, start the machine, adjust for the proper glue film and run the print, label, poster, or photo through the roll coaters, and, in only seconds, it will apply a thin film of adhesive. 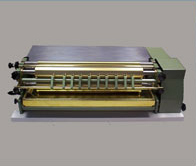 The operator manually positions the paper on the board stock and the glued paper/board combination is fed through the Adjutant Press for a permanent wrinkle-free bond. Click here to view a video showing how to set up and run the Colonel Gluer.